Like most artists, my old work makes me wince. I look at Ozy and Millie and I see its flaws vividly. But I also see thousands of little lessons learned. I started the strip in 1998, when I was 20 years old, and kept doing it for more than a decade. I often say it’s my graduate thesis in cartooning. It still seems to mean something to its readers. And, flaws aside, it still means something to me, too. It reruns every day on GoComics! Or, you can just click over to the archive and plunge straight in. I just wanted to say thank you for Ozy and Millie. There isn’t a day goes by I don’t think about the comic and remember how much it made me smile. It is, and always will be, one of my favorite comics. It saw me through some incredibly depressing times and kept me going. Yeah ozy and mile are also one of my most favorite comic strips. they always bring a smile to my face and elevate my mood. thanks for the good work. This was one of my favorite strips. Sure, the drawing was rough at first but you learned fast and the writing was always great – fun interesting characters, plenty of charm, and terrific insight into all the little aspects of daily life that less attentive writers always miss. It’s always interesting watching an artist’s style evolve over a long term. You can see this even in the syndicated strips such as Peanuts or B.C. 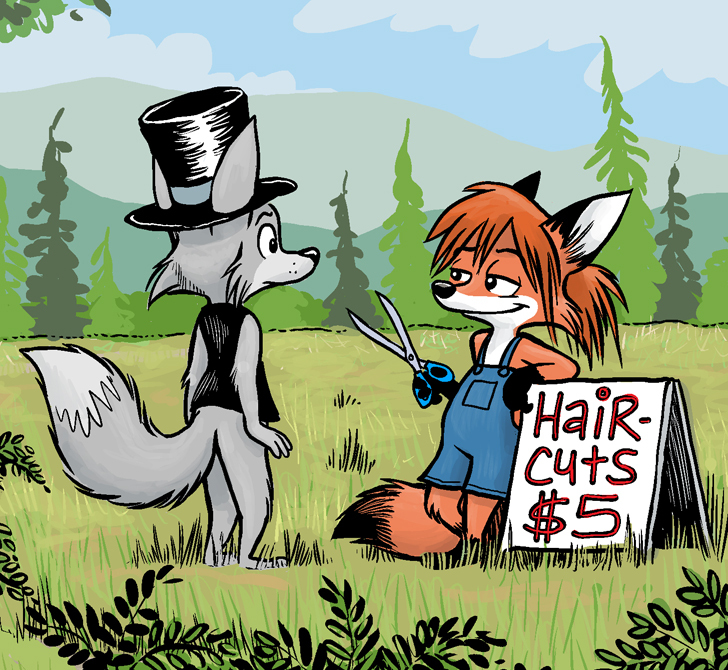 Ozy and Millie is one of my favorites, and whatever mistakes you may have made the art was always good enough to carry the strip. I stumbled on OaM in 2010 and read through the archives in a couple of weeks. This comic greatly influenced me during a time of discovery in my life. I can easily said “I am a better person” because of this comic. With that being said… PLEASE come back. I have yet to find a comic that stirs such wonderful reactions in the folds of my brain and might I add, you did say our adventurous duo would be back eventually. Anyway, great luck to you in your future endeavors and please bring Ozy and Millie back for another round. Thank you. I just found this comic thanks to another one that I’ve been keeping up with, Curtailed. I have got to know. Is Ozy a wolf? I don’t recollect seeing a description of him or Millie on the cast page. I can tell that Millie is a red fox. So, that information would be nice to know. hi I Am A new Fan of Ozy and Millie, The Characters Really Relate To me And My Best Friend, See Were Both Goth Furries And seniors in High School And We’ve Been Through Alot of the same kinda Situations. see I’m Gay And My Best Friend is Streight and Were Constently Being bullied,Him Cause he Hangs out with me. And me Cause I am What I am.Btw I live in Yakima And I must Say Ozy And Millie are some of the Best Furry Characters I love them So much. Learn capitilization please. Also, I wish you luck with the bullying. Caught this comic about 1 year in when Elflife made a reference to it. From that day I have loved and followed it at every turn. Each day I read the original I have framed on my wall and laugh, the humor never growing old (hehe, new coke). CXoming back to reread the archives only inspires me anew. You made something wonderful and your new work on other comic continues to do so. Thank you for the years of joy and the best of memories. I also feel called to express my thanks for your work; it means a lot to all of your readers. Now about that 2014 Ozy and Millie calendar… Plleeeeeeeeaaaassse? 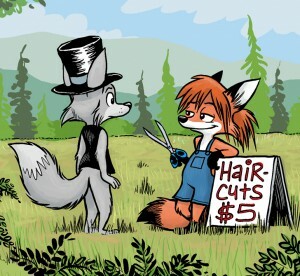 thanks to let Ozy and Millie on the web. Maybe it’s an old and odd comics but I love it fondly. I would love to see more of what happens to the sweet, married couple! I just wanted to say that I really like Ozy and Millie and that I am now enjoying Heavenly Nostrils as well. By the way,one of the characters in Heavenly Nostrils bears an uncanny resembalance to Felicia in Ozy and Millie is this character based on her? And what inspired you to write Ozy and Millie and Heavenly Nostrils? Still remains the only webcomic I’ve paid for. Bought the two big volumes of the completed works when the comic ended. Although Ozy & Millie were the main characters, for me, I mostly enjoyed the strips featuring Ms. Mudd and Llewellyn. Seeing them form a relationship and finally getting married was awesome. I enjoyed my first read-through but now I find that the images no longer appear on screen for me. That issue with the site was fixed within a few days. I noticed it too. Yeah, sorry about that. The server disk filled up while I was out of touch, and caused problems with the web cache. I use Ozy and Millie in my middle school English classes ALL THE TIME. I hope they still load and work correctly from the archives, because I love them. I particularly enjoyed the set about PenSlammeter and I use it EVERY YEAR to introduce Shakespeare to my 8th graders. In fact, it has become an assignment. They have to write penslammeters to pass off iambic pentameter. Been a long love affair, me and your comic – Bought the books to support, too. You downplay it, and I understand why, but it was that grit and raw wit that was, and is, its enduring charm. Best of luck for your current and future endeavors, and I look forward to whatever you fart out of your pens and brushes. It’s great & I swear I won’t troll you – thx for humor! This comic seems a lot like Calvin and Hobbes — Which isn’t surprising, since most cartoonists get their inspiration from Watterson’s work. Thank you, for the comic, and this site. Ozy and Millie have always struck a cord for me. I may be an antisocial writer, but I like being on this site and seeing all the comments. I’d like to ask two things, though. 1.) When do we get a traditional satire to Obama? I hope that said satire will come with a return of the rest of the comic! I found a strip that I thought was a good place to address the question of voices. I cant figure out how to make a link but I can say that it was the strip published on September 8 2004. I’m actually kind of annoyed by the lack of activity on it so far. Just wanted to say I’ve always loved this comic. Also, I wanted to ask if anyone else ever imagined Llewellyn sounding like Sir Bedivere from Monty Python? Even if you try hard or harder, you cannot hate Ozy and Millie 🙂 Yes they are special because from characters to plot, everything compliments them. They are my all time favorite…more power and love to you! Even if you try hard or harder, you cannot hate Ozy and Millie 🙂 Yes they are special because from characters to plot, everything compliments them. They are my all time favorite..more power and love to you! Thank you for this comic, it was wonderful! i found ozzy & millie a few years ago and have loved them ever since. recently i found myself bored and decided to reread the story of this beloved duo but when i started from the first strip(april 29, 1998) and hit the next button, it took me to sept.18, 1998 and then to july 17, 2000; then april 6, 2001…and so on. now i tried again today and had just about the same thing happen and while i’m actually willing to go into your archives and individually open up each day on a separate tab; i’m not entirely sure others will. and the confusion of skipping whole plot lines could cause some younger readers to bypass this amazing comic… and that seems rather unjust to me. now i know your busy and it could just be me that the website is playing tricks on but i thought i’d better bring it to your attention anyways. you know just in case. Hi, thanks very much for pointing this out. It should be fixed now. The strips accidentally got split into two categories by a previous site upgrade, causing it to think there were two strips, not one. Is there some kind of glitch in archive, that causes “previous” and “next” buttons to lead to wrong sites (showing comics from 11.II.2008, 29.IX.2006, 31.X.2001, and few other only), or it’s just my web browser that is faulty? Nope I’m getting that too. I keep being tempted to email Orv about this, but I’m afraid he might just ignore it after not recognizing me. Is this a rational fear? Thanks for pointing it out. Apparently a previous upgrade accidentally split the category the comics were under, causing the site to think there were two separate comics, not one. I’ve re-categorized the strips and I think it should be fixed. If you run into any more instances of the next/previous links being wrong, please do let me know. A friend introduced me to Ozy and Millie about the time Millie set her coveralls on fire in the washroom. I don’t think I missed a day during the run. I followed a few strips back then, and sooner or later I would drift and start giving them a miss. But not O&M. No, O&M got tired of me long before I got tired of it. Ozy and Millie was a true gem. There was joy, detached illogic, sarcasm, cynicism, even some existential angst now and then in the form of bullies. But all of it, even the bullying, had some kind of gentleness to it. There was a palpable sense of transcendence to the strip. It always had the sense of just becoming aware one is waking from a dream, but isn’t quite part of the waking world again yet. It’s hard for me to put into words how much I’ve missed that. I want to thank you for everything you gave us in those years, and for placing it here where we can still come back and remember that sensation. It really is a gift, and I was happy to give back in some small way by collecting the books. I only wish there were more. Anyone else see references to this most wonderful of comics EVERYWHERE? Like in the game Final Fantasy XIV, there is a quest by the name of “I am Milicent, hear me roar!”. I stopped dead in my tracks and laughed so hard I fell off my couch! Most of those are references that this strip makes to other things. I do know that the author of precocious is a fan so we have that. This comic holds happy memories from me. Thank you. and those were parochial schools (you would think a Catholic school would be nicer…NOT! At least the teachers were on my side). There is some problem with the website. It is taking a very long time to get the strips (I am going through the archive and commenting on each one). And I just had an “Error establishing database connection” on one. Will email you a Set for the Winky and Blinky download. If you would like to collaborate let me know. Also want to finish the series and will need another person to help with the illustrations. Thank you so much for this comic, Dana Simpson. I see how much your artistic style has evolved since then, and I am happy too see you finally got syndicated with Phoebe and Her Unicorn. I can’t help but think how much better my youth would have been if Ozy and Millie was around during my childhood, and I love being able to visit them again. These old O&M comics will always have a special place in my heart, perhaps my right ventricle or my aorta. Keep up the great work! I can’t wait to see what you have planned for these characters and other projects in the future. That links to this page that we’re on right now. It is possible for you to to entry our Hungry Shark Cheats by clicking on the Hack Hungry Shark Evolution Now” button above. I tell people often that this comic is the only one I am aware of that approached the intellectual depth, emotional attachment, and hilariousness of Calvin and Hobbes. It absolutely means a lot to me right now and thank you for creating it. Thank you for the comic, would love to see some sort of revisit to it in the future. No matter the length of it. I wish you would return. I love this comic and I want to read more. Is there any chance of you writing more? Sorry, I got busy with various life events and didn’t go through the queue for a while. Mostly only initial comments by new posters, and stuff snagged by the spam filter. But if some new users post a bunch of comments during a time when I’m not paying attention, they do stack up a bit! when Ozy and Millie are created, are you using any of the digital technology currently available? I ask, because it is so ornately laid out with all the detail of C&H. Most papers reduce work so small, the creators are literally forced to think minimally in terms of creating an overall concept no. Our local paper runs them about 4 to 5 inches wide. My vision is still good, although I catch myself holding the paper up close to actual digest various strips.